When I look back in my life, I am thankful for David and Pam, my mom and dad, and Sam and Sylvia. These people loved and invested in me when I was far from God and stubbornly doing things my own way. I am grateful for the patience they showed me when I was stupid, the persistence in being there, and encouraging me when I discounted and ignored them. Looking back I can see how they showed me the love God has for me, the greater purpose He wanted for me, and the simple truth that Jesus makes life better. Take time to pray consistently for your key 3. Initiate conversations with your key 3. Meals (or margaritas) share a meal (or a margarita) together with your key 3. Expect opportunities to show that Jesus makes life better with your key 3. These opportunities may come up because of different life circumstances or questions that come up as you do life together. 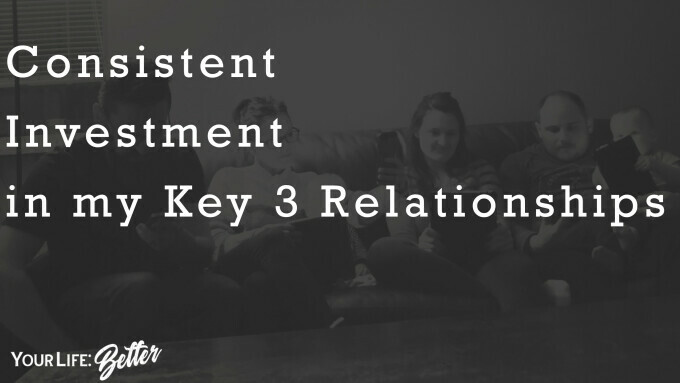 If you have questions about how to consistently invest in your key 3 you can email Kendal Hommes, our Reach Out Pastor, at .